As a dividend growth investor, my goal is to generate a rising stream of dividend income. Thus I would have to be selective not only about picking individual stocks, but also about selecting companies from a variety of industries, countries and size, in order to avoid a widespread implosion in overall dividend income. An investor who diversified their holdings across several sectors, shouldn’t have gotten as many dividend cuts in 2008 and 2009, in comparison to an investor whose portfolio was concentrated in certain high-yielding sectors such as financials, Canadian income trusts or business development corporations. In that case diversification mattered. One troubling fact however is that most of the successful dividend growth stocks that I tend to focus on such as Coca Cola (KO), Johnson & Johnson (JNJ) and Abbott Labs (ABT) are large cap stocks. This could be both good and bad for my portfolio. Most dividend growth stocks have solid competitive advantages as well as large economies of scale, against which few competitors could compete. In addition to that the entry in those markets might be too costly for a smaller producer to challenge the “big guys”. However if I added small or mid cap stocks to my portfolio, my dividend income could be diversified even further. According to Investopedia, Large Cap stocks are those whose market capitalization is above $10 billions dollars; Mid Cap stocks are those whose market capitalization is between $2 billion and $10 billion dollars while companies whose market capitalization is between $200 million and $2 billion typically represent Small Cap Stocks. Most large cap companies are the ones, which are mature and stable cash flow generators, which throw off enough cash to expand, reward shareholders and maintain liquidity. It would be difficult for a company with $100 billion in sales to expand at the rate that a company with $1 billion in sales could. Because of this fact stable dividend growth stocks tend to enjoy a lower price earnings multiple. In comparison, most small and mid cap stocks could spend most of their earnings to reinvest back into the business, thus paying little or no dividends to shareholders in the process. A potential negative for holding the large cap market leader in any industry however is that if the activity in the whole sector declines significantly, chances are that the leader would feel the pinch as well. Despite the fact that the market leader could likely gain market share if competitors go bankrupt or by acquiring weaker rivals, a broad slowdown could hurt it badly. At the same time a smaller competitor could be flexible enough to gain market share by utilizing some sort of a competitive advantage and actually achieve superior earnings growth and reward dividend investors with higher distributions as its sales skyrocket. Smaller dividend growth companies could have a higher price earnings multiple as the market prices in solid future growth. On the other hand, if earnings growth slows down, the price earnings multiple could shrink, leaving investors with large unrealized losses. Even if you pick a promising small or mid cap dividend growth stock, chances are it could get acquired by one of the leaders in the industry. Thus, investors won’t be able to fully realize the full growth potential of the small dividend stock. Although shareholders could generate a large capital gain in the process, they would have to find a new promising candidate for their money instead of patiently reinvesting their dividends. According to Mergent’s, 80% of the constituents of the Broad US Dividend Achievers index are large cap companies, while 14.10% and 5.90% are mid cap and small cap stocks respectively. The Dividend Achievers are corporations, which have increased annual dividends for at least the past 10 consecutive years. The Dividend Aristocrats, which are S&P 500 constituent stocks with history of increased dividends of more than 25 consecutive years, must have a minimum capitalization of $3 billion dollars before they are eligible to join the elite dividend index. Of the 43 companies presently in the index (after omitting the dividend cutters year-to-date and Rohm & Haas, acquired by Dow Chemical), 21 or almost half have market capitalizations of less than $10 billion dollars. 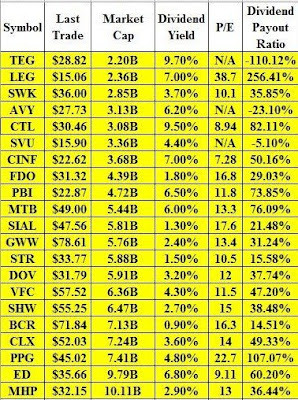 Link to the tableJust remember that not all of the stocks presented below are investment recommendations. At this moment only Stanley works (SWK),Cincinnati Financial (CINF), Dover (DOV), VF Corp(VFC), Sherwin Williams (SHW), Clorox (CLX), Consolidated Edison (ED) and McGraw Hill (MHP) fit my entry criteria to initiate positions or re-invest dividends.